Literary Agents, almost every author who has published their stories in a publishing house has one. But what are Literary agents anyway? what do you they do? In pursuing the traditional publishing ways, many writers believe that upon finishing their book, they can immediately send it out to publishers in order to get an offer for publishing their book. In a long run yes that it is true however there are still steps that a writer needs to take if they would like to be published in an international publisher. When a writer is finished their story, it is called a first draft. This first draft is the version that almost is never published (with a new exceptions of course such as Q&A by Vikas Swarup which went on to become the movie Slum dog Millionaire). Writers need to go through their first draft at least once more, read it from a reader’s perspective which results in many writers tend to change a lot in their novel, producing a much better version of their story. This revision period varies on the author and how much change is going to be made to the first draft. So why do writers need agents? The majority of the big publishing houses won’t even look at a manuscript without it being represented by an agent. This is one of the many advantages of having an agent, with an agent a writers chances of having their work seen by publisher is higher than those without one. To get an agent, writers need reach out to agents and tell them what their book is about; agents usually require a summary of your story and maybe the first couple of chapters. If it catches an agent’s interest he would write back to the writer stating his interest of seeing more of the novel which is great progress to get signed with an agent. Writers should make sure to be able to find the right agent for them, who preferably is in love with your book. The good thing about agents is that they only get paid when you get paid, which means that the dedication that agents have towards the authors that they choose to sign with is high and it is their job to get you published with they want to get paid by the publisher. 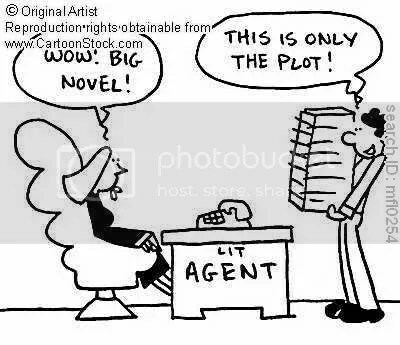 After a writer gets an agent, a few more revisions and changes are subjected into the novel which are basically recommendations and comments that the agent has after reading the writer’s whole novel. These comments are made to further improve the novel and therefore writers will need to be prepared to make some changes to their plots and characters, something not a lot of writers like to do but it is unavoidable. Once both the writer and the agent are happy with the finished work, and then the polished version of the novel gets sent to the publisher by the agent. Then the waiting starts for both the writer and the agent. A warning to all writers: you have to be cautious and very careful on who you send your novel to, there are a lot of ‘agents’ who are con artists and fake people on the web who claim to be agents but are actually story stealing / money leaching vampires. So don’t send your work out to just about anyone who claims to be an agent. The team will be posting a new blog on how to spot a legitimate agent from a fake one so stay tuned for that. We will also be posting some links as to where can one find agents like these; the internet is a vast world where you can find your agent to represent you.